So you want pizza tonight but you don't want to make the dough... well, I got a solution for you! 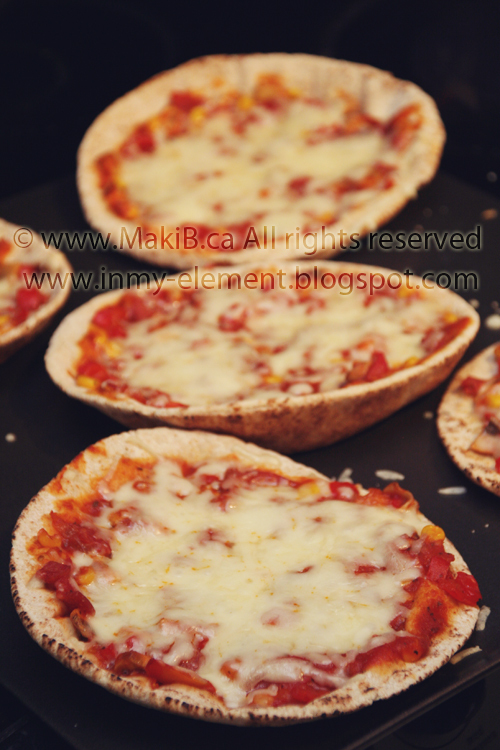 I introduce to you pita pizzas! My version of a "thin crust" pizza. I often buy pitas and store them in the freezer so I have it on hand whenever I want to make this or have a filled pita sandwich for lunch. I can't remember what toppings I used for this pita pizza but really you can use whatever you like. The important part is to saute everything before you put it on the pita since you don't want to bake the pitas too long in the oven because then you would be left with hard shells. And, that is no fun to eat. It goes into the oven just to warm it all up and meld the tastes of your tomato sauce with your toppings. Tomato sauce - I usually buy plain tomato sauce and add extra spices and brown sugar to make my tomato sauce even tastier. Toppings of your choice, cut into whatever sizes you like. I prefer small pieces (so I can hide all the veggies my kids don't like to eat) tee hee. Saute up your favorite toppings to soften them up. Add extra herbs or spices if you prefer, don't forget the salt and pepper! Spread tomato sauce on all the pitas. Add your toppings to the pitas. Spread the tops with shredded cheese of your choice. Put into the oven for about at 425F for 8-10 minutes. Remove, let cool. Cut and serve.